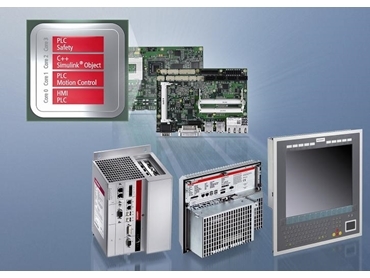 BECKHOFF Automation introduces a new line of industrial PCs based on the new CB3054 3½-inch motherboard. Developed by Beckoff exclusively for multi-core processors, the motherboard represents the optimum basis for modern PC-based control technology in terms of price and performance. Beckhoff provides ideal solutions for multi-core technology on the software side with TwinCAT 3 and on the hardware side, with a wide range of industrial PCs from compact PCs to IP65 panel PCs. The new CB3054 motherboard from Beckhoff is the heart of the new industrial PC generation. Based on the Intel GS45 chipset, the motherboard combines multi-core technology with a socket in the 3½-inch form factor. Beckhoff industrial PCs can be equipped with various multi-core processors such as the Intel CoreTM2 Duo or CoreTM2 Quad in addition to the inexpensive Celeron processors with two cores. The proprietary-developed board has a large number of on-board interfaces such as SATA, COM ports and USB ports. A free mini-PCI card slot enables the integration of further fieldbus interfaces. An additional DVI interface located on the motherboard permits the user to connect two separate displays and develop extensive visualisation solutions. The CB3054 motherboard has a PCI-Express extension, which can be used for further interfaces inside and outside the industrial PC. The Beckhoff C6930 control cabinet PC for example, enables users to have up to seven independent Ethernet ports at their disposal in an exceptionally compact device.